Antonin Guillot. The American Camp at Allerey (1918-1919). 1999. The American hospital centers and the construction of the camp at Allerey. Map of American installations on our railway lines and in our ports (including base hospitals). In September 1917, the surgeon general of the A.E.F. recommended thatf five units of type A (base hospitals) be contstructed, which would constitute the hospital center of Bazoilles-sur-Meuse. As the participation of Americans in combat grew, larger and larger centers were set up. On December 12, 1917, authorization was given for the construction of ten type A base hospitals, in Allerey (Saône-et-Loire), Beaune (Côte d'Or), Mars and Mesves (Nièvre) respectively. On the 13th, a project of 3,000 beds was approved in Nantes. Before the end of December, the installation of other centers was authorized for Bordeaux-Beau Désert (5 000 beds, to be increased to 20 000), Langres (2 000 beds), Rimaucourt (2 000 beds, to be extended to 9 000), Limoges and Périgueux (number of beds to be determined). Progressively, other centers were added: Vittel-Contréxeville, Savernay, Vichy, Toul and Côte d'Azur, so that in the end there were were twenty American hospital centers in service upon cessation of hostilities, of which five were in advanced sectors, eight in intermediate sectors and seven in base sectors (see table below). As well, a certain number of others were projected or in the process of being constructed. While the sites were selected by American authorities; in some cases they had been suggested by the French. The decision to accept or reject a site was made by a bureau composed of both American and French officers. The rentals of site property were made by an officer from the Quartermaster Corps , but construction was the responsibility of the Corps of Engineers. The approval of a site was essentially determined by its conformity with the number of beds authorized in the different sectors, by the resources available and by access to railway service. This latter requirement took into account the distance from the front, the rolling stock, etc. Given that the French controlled the railways, their opinion and collaboration were necessary for the determination of the sites of the hospital centers. 1. Existing French buildings and barracks of recent construction, hotel group lodgings or military barracks. Centers would include two to seven base hospitals,with capacityies ranging from 1,000 to 16,000 beds. The main centers of this type were located at Vittel-Contrexéville, Vichy, on the Riviera (barracks at Toul, hotels for the rest). But these buildings, often poorly adapted for such use, required sizable modifications or additions and refurbishing. At the Armistice, six centers were functioning in French buildings with a normal capacity of 38,340 patients, extendable to 51,520 in case of emergencies. 2. The centers included specially constructed barracks and contained a certain number of hospital units (base hospitals) of type A, from two up to twenty, plus a number of common outbuildings. Each of these base hospitals had been designed to have 1,000 beds, with possible expansion of from 50 to 100%. Each center was supposed in addition to include a convalescent camp with a capacity of 20% of the number of "normal" beds at the hospital center. Some of the most important elements taken into account by the American services in establishing these centers were: adequate railway location and access, with connections to the base hospitals, the possibility of using common buildings (offices, storage, garage, bakers, cold storage, post, telegraph and telephone office, fire department, laboratory, chapel, morgue), the construction of roads and means of improving sanitary conditions, water resources, sewers and lighting systems. Reception tent at a base-hospital. 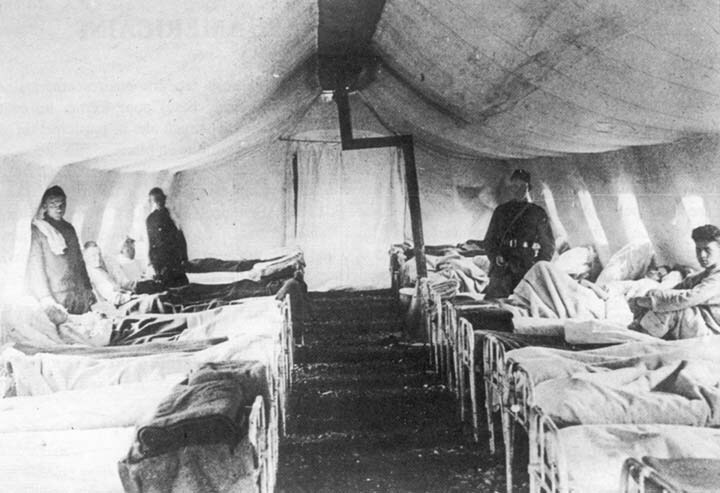 Inside of a recovery tent in an American field hospital. The largest centers, several of which had an anticipated capacity of 20,000 beds, were veritable cities with all their usual needs. 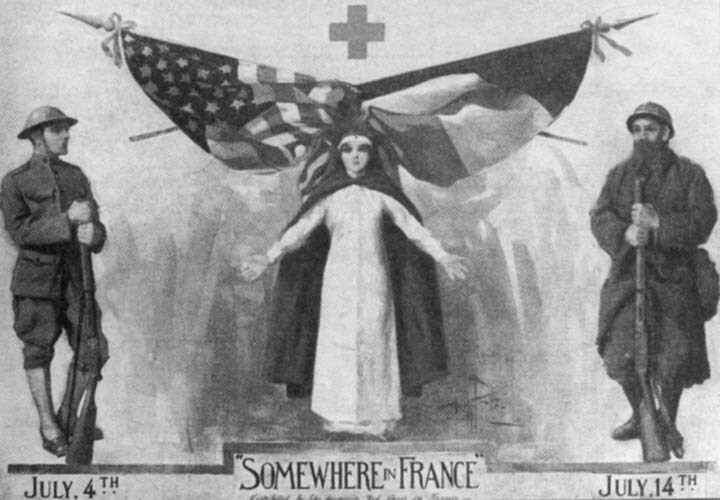 When the Armistice was signed, 14 hospital centers were functioning with specially constructed buildings and their total capacity was more than 69,000 beds (plus 127,000 in cases of emergency). But few of these barracks were totally finished, many had to be occupied while they were in the process of being constructed and it was necessary that the personnel and convalescents help put on the finishing touches. Nonetheless, one of the dominant features of all these centers was the existence of hospital units (base hospitals) specializing in the treatment of certain illnesses and therefore so equipped. The largest center was that of Mesves (Nièvre) ; on November 16, 1918, it had a total of 20,186 patients. As of November 14, 1918, patients in hospital centers numbered 109 238, plus 22 191 men in convalescent sectors---for a total of 131 429 men. (a) Evacuation Hospital N° 13 functioned until November 30, at which time it was relieved by Base Hospital N°91. Base Hospital N° 90 never received patients. (b) Personnel in place, but never received patients. (c) Received no patients until after the Armistice. June 1917. A sixteen-year-old boy, G. Noury, who had come from the village of Saint-Gervais-en-Vallière, near Allerey, happened to be at the Chagny station where, for the first time, he saw same American soldiers who had come to France not long before. He was struck by their khaki outfits. They exchanged a few words with him in English and offered him cigarettes and chewing gum. He did not think he would be seeing any more soon. But one winter day in 1918, while he was working as an apprentice smith at Saint-Loup-de-la-Salle, he and some friends saw two American military trucks drive up and their drivers ask the way to Allerey. Everyone looked at these vehicles curiously because military trucks had never been seen in these parts. Shortly afterwards they learned that an American camp was going to be established in Allerey in order to set up a hospital. In February 1918, three or four American soldiers, one of them an officer, came to Verdun and stayed at the "Le Soleil d'Or" hotel. The setting up of a hospital camp was confirmed when a detachment of American officers came to Allerey. "An American medical health service camp --- For some time now, we have been informed that the town of Allerey had been chosen for the installation of a vast American medical health service camp. After several visits to the site by Franco-American commissions, the project is allegedly on the verge of being carried out. The camp will be comprised of ten hospitals of 1,000 beds each and will occupy a total area of four hundred hectares [988 acres], including a cemetery of a little more than one hectare [2.47 acres]. The land chosen is located in a cheerful countryside, along the road to Beaune, near the château and not far from the woods. This the best land in the township and the most salubrious. At this time, it is covered with wheatfields or vineyards. The rent for the duration of the war has been agreed to at the rate of 500 francs per hectare for prime land; 400 francs for second class land and 300 francs for third class. A track will connect the camp to the station and a second line will be constructed on the Gray line, from the hamlet of Chauvort to the camp. Wells will be drilled for obtaining drinking water. Electricity will be installed for lighting, and telephone and telegraph services will be established. And, in typical American fashion, we have been assured that three months will be enough to complete the whole set up. The installation of this camp is certainly a bit of good luck for this township which, benefiting from its location as railway head, was the preferred choice of the Americans. The agicultural and wine production of the region and local commerce will be happy for this turn of events, and we might even venture to say that, in the future, the town of Allerey might find itself transformed into a large city after its occupation by our powerful allies." On December 12, 1917, the American authorities had in fact decided upon the construction of a hospital of type A in Allerey; and in the month of January 1918, a group of officers were sent from the American headquarters at Chaumont to look around our area and chose the most suitable sites at Allerey and Beaune for the installation of hospital centers. The Americans wanted to move quickly. A rental agreement was established between the American Army and the Town of Allerey, effective January 1st, 1918, renewable monthly, at an annual rent of 16 714 franc ; payments would be made each trimester. In addition, at the beginning of February, the town authorities of Verdun, at the request of the American Red Cross, launched an inquiry in the canton to identify buildings which might house convalescents. 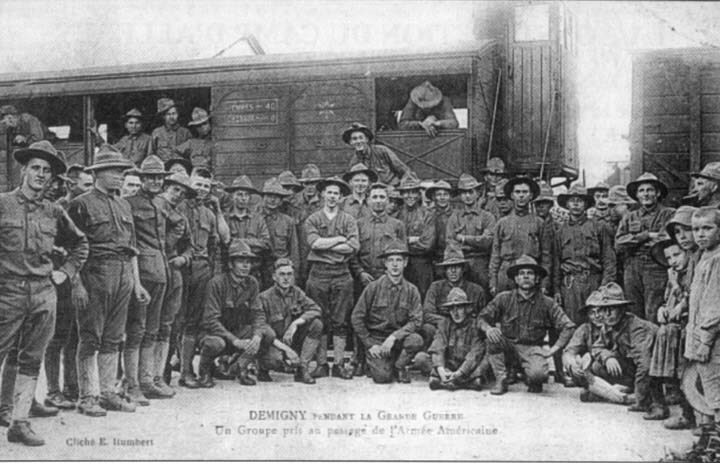 American soldiers passing through the Demigny station in 1917. Allerey. 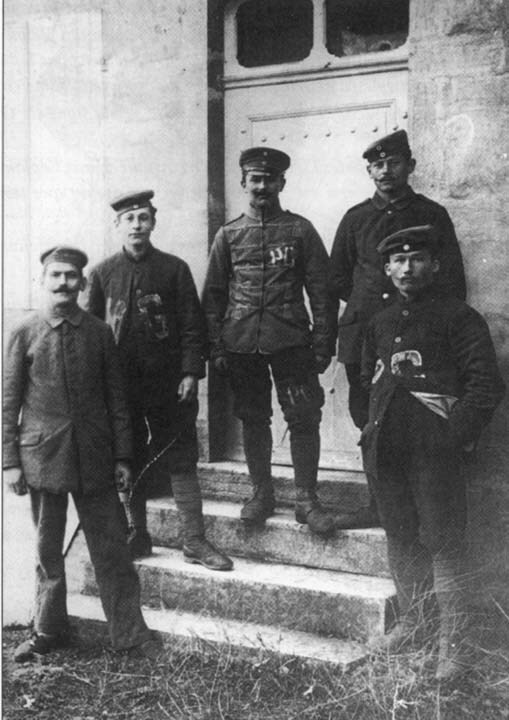 German prisoners used in constructng the American hospital-camp. The response was of course generally negative: either the places proposed were unfit and barely usable, too dispersed or too far away. At Allerey, all available lodgings were already occupied by the heads of the construction companies who were going to install the hospital. It was therefore necessary to envisage other solutions. The site of the reservation(4) covered an area of 172.3 acres, which consisted chiefly of farmland, but included some swampland at the eastern end and some woodland at the western. The site was low, and generally very level, most of it (e. g., section 4) being lower than the edge, so that proper drainage was difficult. The soil consisted of a layer of loam, from 6 inches(5) to 2 feet in thickness, superimposed on clay; and though rainfall readily percolated to the clay stratum protracted rains soon saturated the upper layer. Climatic conditions during the existence of the center offered nothing unusual for this region. The summer of 1918 was hot, dry, and at times windy; spring, autumn, and winter were rainy, with almost constant cloudiness during the last-mentioned season, and marked by cold of a penetrating character, but without very low temperature. Rainfall averaged 840 mm. per annum, the mean temperature was 10.520° centigrade." With this context made clear, let us proceed to the construction of the camp. First of all, the roadways had to be laid out. The corps of engineers built temporary roads according to plan, but it was impossible to make them hold up, due to lack of materials and labor. At first, cinders were used as road surface cover, but with the incessant passage of heavy convoys of materiel destined for the construction of the camp and with a continuously humid weather, they were quickly broken through and became impassable. Later, wagonloads of stone were poured as fill, particularly near the warehouse, HQ and along the railway line. With the help of a steam roller, a harder surface was attempted; but relief was to be of short duration, the stones sinking into the earth due to an ever-increasing traffic. In certain sections, heavy meshwork was used, but there again without success. Towards the end, a few roads were surfaced with timbers (railroad ties). In contrast to the of camp roads, the French ones which bordered on the east (the road to Pussey) and to the south (the road to Beaune) handled an intense traffic and required little maintenance. On February 16, 1918, two officers and four members of the Corps of Engineers began laying out the site of the hospital itself, subsequently undertaking the construction of buildings with the help of local civilian manpower hired by French entrepreneurs. A problematic labor force, as healthy men were in short supply and it was necessarily composed the old men, young boys and undraftables of the area. At the same time, the people of Allerey and roundabouts were hired by the camp contractor to unload materials arriving at the Allerey station and transport them to the site in horse- or ox-drawn wagons. Henri Baillard, 18 years old, made the trip every day from Ciel, with a wagon and two horses, to transport prefabricated barrack elements which had come from Switzerland by train. Others came from the town and hamlets of Allerey, from Saint-Gervais-en-Vallière, from Gergy, etc., to do the same and thereby earn a few francs each day. Towards the end of February, the materiel was arriving at an accelerated pace and in such quantity that the station warehouses at Allerey were soon full: 109 cars had to be unloaded at the neighboring station of Saint-Loup-de-la-Salle, and the materials transported the 7 kilometers separating the two towns. The construction of the camp barracks had been contracted out to General Constructors Gauthronet, Mage et Jacquet, from Paris, who, in early February, had set up one office in the Allerey train station and another in Verdun, and later, in May 1918, in the camp itself.. On February 15, the sub-prefect had asked the mayor of Verdun to find furnished lodgings in the towns around Allerey to house the engineers and diverse personnel of the Gaudthronet company. Secretaries were hired: Mlle Chapot, from Verdun, Mlle Clémence Bonnot, from Verdun (who would later marry and American), Mlle Alice Develle de Palleau ( M. Gauthronet's personal secretary, who would marry his son), Mlle Gros and Mlle Légeley, of Allerey. At the engineering office there were a Frenchman and two Swiss, and two or three draftsmen at the drafting office. The company's secretary general served as the interpreter. If the recruitment of labor had posed problems for the Americans and for the construction company, it was the same for the population and French authorities. With an economy almost entirely devoted to the war effort, farming activities found themselves to be in a precarious situation: the absence of the majority of adults (who had been drafted), the lack of manpower, the rarity of fertilizers, a fickle market. The rural world was living in slow motion and, in early 1918, enclined towards a certain fatalism. Thus, the arrival of the Americans in Allerey, Beaune and other places, seemed to many to be both benediction and cause for hope. All those men and women who were "surviving" in the towns of our Verdun region turned out in great numbers to be hired at the American camp at Allerey for work which generally required little qualification. "GERGY --- Abandoned fields. ---In Gergy, the classes of 1889, 1890 et 1891, on leave, have rendered immense services, and we would no longer have any untilled fields if the American sanitary establishments and warehouse work...at the Gergy station had not deprived us of laborers by offering daywork at 1 franc an hour; a hitch team is paid 20 francs a day. We are even informed that three hitches under the same owner are paid 75 francs. This means wealth for the farm workers, for the farmers even, but to the detriment of fields which until now have been regularly cultivated. The Americans are beginning to use the Huns, and that's good. But they shouldn't stop there; what's needed is that all farm workers without exception be returned to their fields: if our energetic prefect would understand this, he would waste no time in putting everyone back in his place. These farm workers, given the high prices of produce, could be paid a good price. They would find it was scarcely different than what they are paid in Allerey, after figuring in the cost of the trip, the wear on shoes, clothing and other expenses which all that travel implies. A farmer." Doubtless spurred on by the cantonal authorities, by 27 February, the sub-prefect had already written and telegraphed all the mayors of Gergy and Verdun concerning the "labor for the camp depriving farming of help" and asking for information before March 1st. At the American camp in Beaune, the same sort of recriminations were made by wine-growers and wine-merchants. "obtained in this way was of very bad quality and requiring permanent supervision. Moreover, the habit that contractors had of inflating pay sheets obliged the Corps of Engineer officers to conduct continual verifications"...... ! "ALLEREY --- The American camp . --- For several days, Allerey has begun to buzz. On the station platforms, boards and material for the construction of the hospital are being hastily unloaded. In the streets, wagons are moving hither and thither taking materials to their destinated places. . Upon leaving Allerey, notably on the road to St. Loup, one notes a large area already covered with stacks of wood laid out in order and ready to be assembled. While the transport of materials by wagon is the province of the inhabitants of Allerey; a certain number of foreigners, Belgians among others, are employed at different tasks. Only 5 or 6 American supervisors have arrived so far, the rest will not come until the work has been finished. An office is set up in Allerey and another at the Tixier lodgings in Verdun. some local girls from the area and surroundings are already working there at good jobs, and not long from now a good number of local inhabitants, men, women, and children, will be employed in the services of the American camp." The type of wood building adopted for the hospital center was of Swiss fabrication and not very solid (according to the Americans). These barracks, called "Canadian" or "type 1", were also known by the names "CAVANAIR" and "MAJORAM" and were supposed to be perfectly insulated (according to the contractor). They were assembled by putting together identical elements with a double wall of 2 cm thick, leaving an air cushion of 10 cm. These elements made up the exterieur walls; the floors, ceilings and roofs being made from boards 2.5 cm thick, with the latter being covered with tar paper. Partictions made from reinforced cardboard and lattice divided the space appropriately into rooms. All these buildings were 6 meters wide, while their length varied from 10 meters for the smallest to 50 meters for the common rooms. The glass for the windows was supplied by the Gentinat company, of Chalon. In the beginning, terrible weather slowed down work to such an extent that, on March 23d, only 10 buildings had been put together. Rain had left the terrain in such bad state that only ox-drawn wagons could advance in the mud. However, little by little, drainage ditches, culverts and secondary roads were put in. Given these various set-backs, the construction of the camp did not progress at the rate foreseen by the Americans and it was only on May 19th, with the arrival of a company of the 26th Regiment of the AEF Corps of Engineers that the work was carried out more rapidly. Finally a company was asssigned to the hospital center, reinforced by 40 German prisoners-of-war and 20 Rssians who had been sent to France at the beginning of the war. Towards the end of June, more than 300 barracks were erected. On the 20th, officers and enlisted men arrived, along with 65 nurses and other personnel, to comprise the first hospital unit (Base Hospital n° 26) at the completed premises. From June to September, four other units would be put in service. The first wounded did not arrive until July 23d. The ensuing construction and outfitting of the Allerey camp was in fact spread out over the entire year 1918. 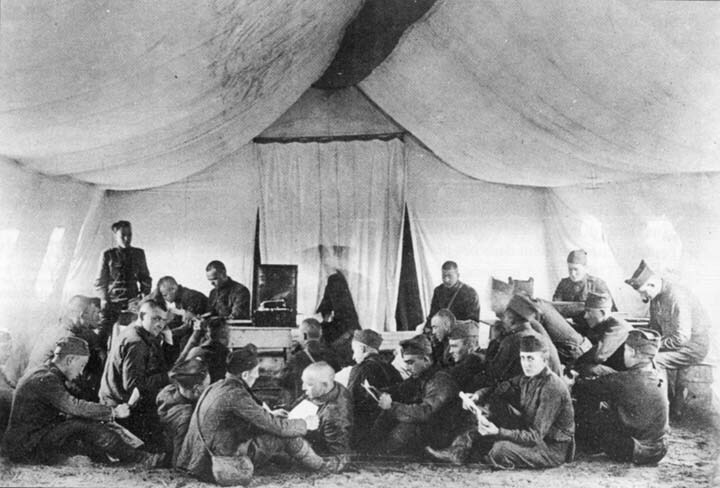 According to American archives, a sizable contribution towards this work was made by the enlisted men of the Medical Corps and by the convalescents: "As the groups arrived, the personnel from each one was given the responsibilit of finishing off the installation in the zone which had been assigned to them and they pursued this work even after the admission of patients.". Yesterday, on the occasion of the American Independence celebrations, the ceremony of the presentation of the flag---a gift of the camp contractors--- to the American 26th Corps of Engineers was held under the auspices of his Honor, the Saône-et-Loire Prefect, and Senator Richard, the mayor of Chalon-- as well as the inauguration of 350 completely-built barracks out of the 500 which are to be raised. ( ... ) At 10 o'clock, the Prefect, accompanied by Senator Richard, the Sub-Prefect of Chalon and his chief of staff, arrived by automobile; and were met at the camp entrance by Colonels Hartley and Ford, Captain Harris; the Gauthronnets, chief contractors; Roch de Christofaux, the general supervisor of work; Sammarcelli, secretary general; Guillemard, the mayor of Allerey, head of the municipal council; Magnien, mayor of Verdun and council for the arrondissement ; Bidault-Bruchet, cantonal delegate, etc. The Army troops and Gendarmerie performed the honors. In giving the flag to the American troops, the Prect said that for a long time he had wanted to come greet our American friends, but overwhelmed by his work, he had not been able until now to accomplish this duty; he was happy to see this great enterprise be completed and was happy today to come in the name of the Governement to pay his respects to America's independence. "We have been raised with the same principles and same sources of law; upon the call of your president Wilson, you rose up to defend democracy in danger. The flag which I have the honor to give you will be in good hands and soon Teutonic barbary will be struck down." The flag was then raised on a flagpole while the bugles sounded the call to colors.. Colonel Hartley gave a speech in English which an interpreter translated for the Prefect. He finished by again addressing his thanks to this working population of Frenchmen who had so greatly facilitated his task. A young boy from the assembled Allerey schools read a compliment to the Prefect, then three young girls offered wreaths of flowers to the officials. A visit of the barracks took place under the guidance of technical personnel who gave explanations to the Prefect who seemed very interested in these grandiose works. It is in fact known that 500 barracks housing 10,000 beds are to be built. Begun last April 14th, this work constitutes a veritable tour de force for which we should congratulate most especially the Gauthronets, general contractors, and Roch de Christofaux, since in less than four months six tenths of the work has been finished, with 350 barracks completely erected, and the first contingent of wounded expected any day. Sixty American nurses, who arrived this morning, were able to take part in the celebrations. The camp will be composed of ten groups, each with its own hospital and distinct services; a spur line from Allerey will bring the wounded to the center of the camp where a train station was erected in eight days; the patients, thusly, will not have to support any transfers. With the visit of the camp completed, the officials met in a barrack where lunch was served. "Gentlemen, I ask you to lift your glasses to the health of President Wilson, of our great sister nation, and of the success of righteousness and justice." Colonel Ford answered in a few words, saying that the Americans do not forget that they owe their independence to France and that the names of Lafayette and Rochambeau will forever be immortal. The ceremonie over, the Prefect took his leave, regretting, he said, not to be able to be present at the banquet, and returned to his automobile. At noon, a banquet of 50 settings took place at the Soleil d'Or, in Verdun, Colonel Arthley presiding. At the table of honor were Senator Richard; Monsieur Bodenan, Sub-Prefect from Chalon; Colonel Ford, etc. All washed down with fine white and red wines from our Burgundy region. During the meal, true friendship reigned between the American and French guests. After the banquet, speeches were made by Senator Richard; Colonel Harthley, Monsieur Bodeman, the sub-prefect, and Colonel Ford. At 4:30, the festivities came to an end and everyone left with the best memories of this Franco-American celebration."